Dieppe is often referred to as the modern day “Capital of Acadia”, and for good reason! Part of a booming Greater Moncton Area, Dieppe also stands on its own as a cultural and economic leader in the province. Despite the fact that we have always received great support from Dieppe and Metro Moncton (and maybe partially because of this! ), for years Vienneau Insurance badly wanted into the area with a local “home base” to claim as our own. The opportunity finally presented itself back in 2014 when fellow local independent broker Beausejour Gaudet Insurance decided it was time to call it a career and sell its operations. 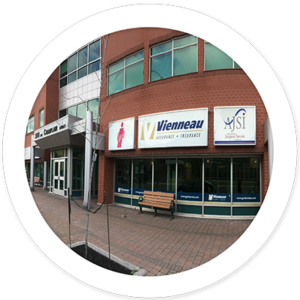 It was a perfect fit, and so Dieppe became Vienneau’s fourth and most recent office location. Our Greater-Moncton clients benefit from a full-service location, with Home and Auto, Commercial, and Life and Travel Insurance experts on-site. We’re pretty easy to find too, with our office centrally-located in the heart of Downtown Dieppe (200 Champlain St). Drop in, call, or chat with us online today to give “Worry Pas” insurance a try! Alberte is the sweet voice you hear when calling the Dieppe location. She has many years of experience in the administration field, having worked at Viva Canada for almost 20 years. When she’s not at work she enjoys spending time with her family and friends. Manon has two decades worth of Insurance experience under her belt. Her career includes time on the agency side, the Life and Benefits side, direct writers/call-center, and of course brokerage. So, not to say that she’s seen and done it all… but pretty close! In her spare time, Manon loves to paint, travel and spend time with her friends & family. She is also a volunteer with George Dumont’s “Arbre de l’Espoire”, and is a former Chair of the Young Business Professional Women organization of Moncton and currently a member of Club Rotary de Dieppe. Josée is a consummate professional who constantly strives to do right by her clients. Having started her insurance career in 2010 as a Claims Adjuster with RSA Insurance, she joined our team in 2013 and has completed her Canadian Accredited Insurance Broker (CAIB) in 2017. Josée is the proud mother of a young family who enjoys spending time with her family and friends. Rachel Vienneau joined our Dieppe office in 2017 after having spent the better part of 15 years perfecting her customer service skill in local customer contact centers. Rachel hails from the small NB community of Lagacéville. She enjoyed her small-town upbringing, but did not hesitate to move to the big city of Moncton upon graduating from high school. She originally studied to be an esthetician, but fate had other plans for her and she discovered her skill and passion for customer service. Tracy is “miss organized” at our office, as she is always on top of things. She joined us in 2009 as a Personal Lines Broker. Prior to joining our team, she was in an administration and accounting roles for 15 years. She received a Diploma as a Medical Secretary from Atlantic Business and has complete her Canadian Accredited Insurance Broker (CAIB) designation. Tracy enjoys the great outdoors, and being a hockey mom. Chantale is a seasoned insurance professional who has been working in the industry since 2003. She joined our team in 2015 as a personal lines account executive, and is known for her infectious positivity and can-do attitude that is appreciated by clients and co-workers alike. In her spare time, Chantale enjoys painting, reading and spending time with her family. Always eager for a challenge, Tanya joined our team in 2016 to pursue an opportunity to join our commercial insurance team following over 12 years in the industry in Admin, Claims, and Underwriting roles. A small-town girl originally from Petit-Rocher, Tanya is a passionate and driven individual. These qualities that have served her well in protecting our commercial clients. Tanya’s passion extends to her widespread involvement in numerous community causes. She is currently President of P.R.O. Kids Dieppe / Memramcook. When not in her business attire, you may spot Tanya out at a gym in her workout clothes as she is a licensed Zumba fitness instructor. Jacques is a native of the quaint New Brunswick community of Eel River Crossing, NB. Shortly after his graduation from Université de Moncton’s Business Admin Program, Jacques joined the insurance industry in 1991 as a Financial Advisor. He is currently President of Assurance Jacques Savoie Insurance Inc., which is the sole firm entrusted with servicing Vienneau Insurance’s life and group benefits clientele. When he’s able to pull himself away from his work, Jacques enjoys playing golf, hockey, and traveling.